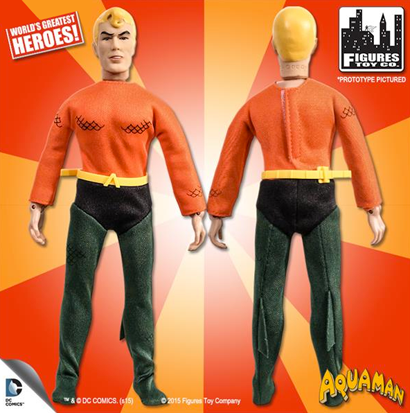 Coming in March from Figures Toy Co. is this Mego-riffic Aquaman doll, part of the deluxe Super Friends line! The Sea King here is pretty close to the one seen in the cartoon, complete with tousled blonde hair. 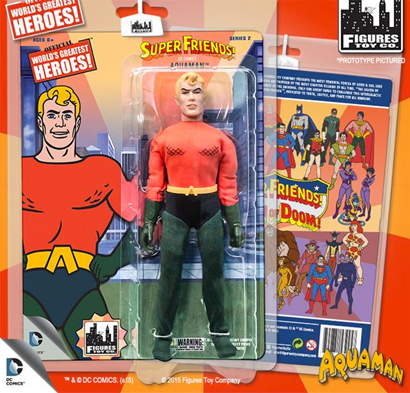 I hope he comes with a JLA Communicator that you can bury in the sand for a million years, as well. Oh, that would be awesome! Cindy and I were re-watching the TNG 2-parter "Time's Arrow" this weekend, and it occurred to me that they ripped off Aquaman's famous move in that episode!